Looking for motorcycle finance? And furthermore we also offer scooter finance too! Because our offers are the best, customers can take advantage by paying monthly for one of our bikes or scooters yet we can source ANY make or model. Please fill out the secure motorcycle finance application form below. It maybe looks like a lot of information but almost all of the information is especially relevant in getting customers the right deal. Furthermore applications really do take just 5 minutes. How long do I have to wait for motorbike finance decision? Finance advisors will aim to get an instant decision via text to your mobile. If your application is referred to an underwriter you should be waiting no longer than 24 hours. Applying out of business hours or during busy times means the application may be processed the next business day. Alternatively; you can call us on 01343 548412 and we can process the application for motorcycle finance over the phone, if you have all the information ready, the phone application should probably take between 5 and 10 minutes to complete but due to busy periods could therefore mean you recieve a call back. Working 16 hours a week or more is classed as full time. Furthermore, applicants require to be minimum of 18 to qualify for motorcycle finance. Students are accepted but sometimes require a guarantor. Get in touch if you have any questions, our advisors are more than happy to help. 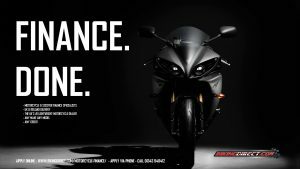 Many of the prime finance lenders such as black horse changing their scoring of applicants has resulted in stricter motorcycle finance acceptance criteria. Consequently one of the main contributing factors in being accepted now is the deposit, offering a minimum deposit of 10% shows the finance company you have the ability to save, and seems like you have the disposable income required. As a result we HIGHLY recommend when applying you select the 10% deposit option to increase the likelihood of being accepted on cheap motorbike finance. If you choose not to offer a deposit your application will be more difficult to be accepted because lenders see the offer of deposit as coming from someone who manages their money and subsequently has control over their budget. In addition if you rather not to disclose details using the online form you can download this form, and return it by post or email (details supplied on the form). Finally, when is my first motorcycle finance payment? Either one month after signing the agreement, or in some case 2 months after. As a result, in most cases you should recieve the bike or scooter before you make your first payment! This does depend on stock availability, and even if the bike or scooter is out of stock your accepted motobike finance agreement can sit in limbo for up to 60 days before being processed. which is another way to guarantee you are first in line when the next batch are in stock. Use our recommended insurers below, due to our connection with these insurance companies make sure you tell them Biking Direct sent you. Therefore you have a better chance of getting cheap bike insurance. Another especially relevent fact is that we are regulated and authorised to offer motorcycle finance by the Financial Conduct Authority. Our authorised FCA License is HERE. Want to check out the range of motorcycles & scooters again? Use the following quicklinks to get to where you want to go to fast. And furthermore, remember to return here to apply online for scooter & cheap motorcycle finance. this is unbelievable. I was not given finance by any one else but these guys got me it. 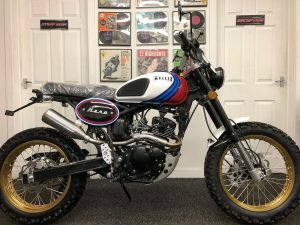 just waiting for my bike now - Lexemoto LXR - woohoo... hope its as good as what folk say it is. bike finance is sorted anyway, payments are not too bad considering my crap credit rating. so as long as I make payments my credit rating will go up so the guy told me. just bought my first bike here, finance was easy, paperwork was simple, just waiting on the bike now - cant wait. 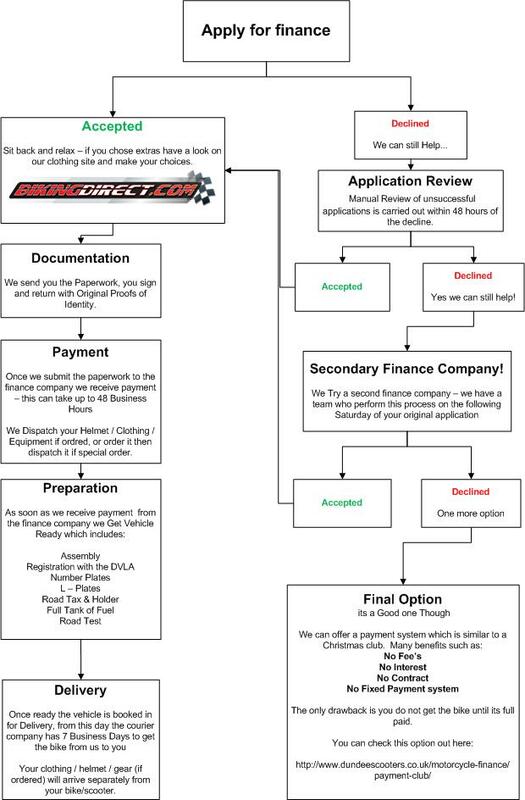 Simple and easy finance process. Didn't think I would have gotten finance but I did. very happy so far, just waiting on the bike now. Just placed an application for finance on a GSXR 125 on the website. My phone is broken so would it be possible to have my decision sent to my email rather than my phone? Hey. Can you call me back on 077*******3 (number hidden on front end) I want this bike. That’s me submitted the form. When will I hear and get the bike? Thanks. Bike arrived today. Absolutely stunning. Thanks guys. hi, I spoke to you earlier, I just wanted to let you know that I got accepted for finance, am very surprised and am delighted. thank you so much, this will be an amazing christmas. thank you. How likely am I to get finance if i have rubbish credit? We have a very good success rate at getting most credit types accepted. Nothing to lose by filling out the form.